Each time Apple launched a totally redesigned smartphone, the image of the final product was well kept until the big event, when the device was officially introduced. It’s true, there were a couple of leaks, but not with the entire phone. Of course, the image was shortly removed, but it was up enough so everybody could take a peak at it. And share it over the web, of course. So, we do know that it’s going to be available in three color versions, the same as the iPhone 5S. Also, it’s going to support LTE, 3G, CDMA and GSM networks. 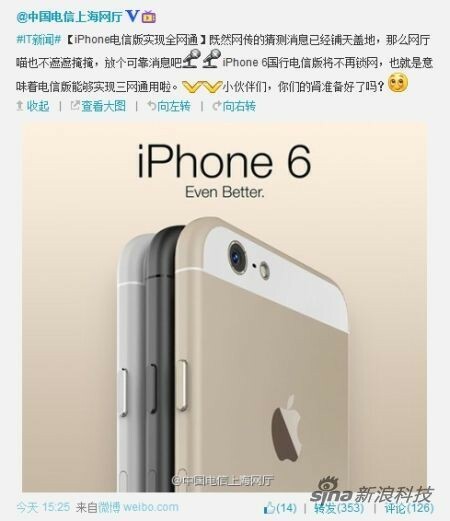 China Telecom was known for not selling Apple’s phones unlocked, but the iPhone 6 will be available unlocked. We’re very curious about what Apple did about this. I mean…it must’ve been a bit frustrating for them to see this picture all over the internet before the launch scheduled for September 9. What do you guys think about the iPhone 6? Could this be one of the best phones of 2014?